Abstract: This article presents a comparative analysis of three interrelated phenomena: the use of imperfective verbs in sequences of events in Czech, Slovak, Sorbian, Slovene, and BCS; the use of po- delimitatives in sequences of events in East Slavic, Polish, and Bulgarian; the semantic nature of the prefix po- in the individual Slavic languages has been retained (and perhaps strengthened) due to German language contact, whereas the use of po- delimitatives for such atelic predicates represents an innovation in those languages that did not undergo significant amounts of such German language contact. The second is that the lack of the development of po- into an important perfectivizing prefix in the western languages is likewise due in part to German language contact, as po- was at various times used to calque German be- in its surface-contact, in the western languages is likewise due in part to German language contact, as po- was at various times used to calque German be- in is surface-contact and transitive meanings as well as ver- in its meaning of change of state; such calques contributed to the stabilization of po- as a lexical prefix in the western languages. The retarding effect of German language contact on the western languages whereby imperfective verbs remained acceptable in sequences of events, and po- did not become a major perfectivizing prefix, is analyzed as the result of a process of "replica preservation," as opposed to the more commonly discussed process of "replica change" describe by Heine and Kuteva(2005). Abstract: This paper discusses syntactic and semantic aspects of direct object scrambling in Ukrainian. Given the complex nature of scrambling, the investigation is narrowed to only one of its types: the change SVO to SOV, defined as Middle Object Scrambling (MOS). This strategy affords a detailed examination of this phenomenon at a micro-level. MOS is scrutinized with regard to its syntactic aspects (e.g., position of a moved element) and semantic properties (e.g., possible interpretations of a direct object). The semantic features of definiteness, referentiality, and partitivity are particularly emphasized, as previous studies have claimed they play an important role in the process. This research demonstrates that the most relevant feature in Ukrainian MOS is specificity in the sense of partitivity/presuppositionality. The implication of this is that Slavic data provide further support for the universality of interpretational properties of the vP edge, in line with Chomsky 2001. 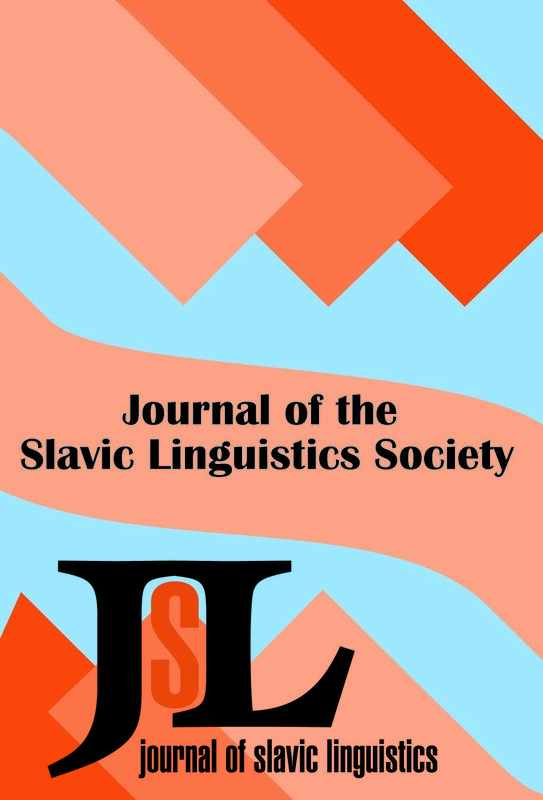 Abstract: This article explores whether the aspectual cluster model proposed by Janda (2007, 2008) can reflect the differences in the lexical semantics of Russian verbs denoting sound. A corpus of fifty sound verbs, including both sounds emitted by inanimate objects and those produced by animate beings, are divided into two groups: (i)paired verbs marking linguistic action, and (ii) paired verbs marking directional motion. Aspectual clusters for each verb were determined, and the clusters of various groups of verbs compared. Each of these groups was found to be characterized by a specific subset of aspectual cluster types.